STATIST EU DIRECTIVES FORCING FINNISH EGG PRODUCERS OUT OF BUSINESS, LEADS TO EGG SHORTAGES IN PARTS OF FINLAND……. – The Tundra Tabloids……. 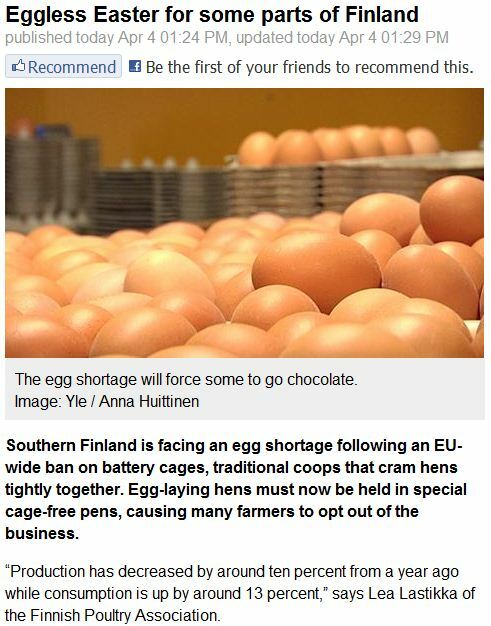 STATIST EU DIRECTIVES FORCING FINNISH EGG PRODUCERS OUT OF BUSINESS, LEADS TO EGG SHORTAGES IN PARTS OF FINLAND……. The more regulations you have, the less of services and products you have. No matter how many times the statist does it, the results will remain the same. Utopians refuse experience because they need to promote their moronic agendas unfettered with reality, to do otherwise would mean learning from past. NOTE: To all my Finnish readers who adore the EU, do you really like these faceless bureaucrats dictating what you can do, how you can do it, and when you can do it, without any way of directly holding them accountable? Previous Post Previous Post ANDREW BOSTOM’S SERIES: ANTI-SEMITISM IN ISLAMIC TEXTS, THE HADITHS……..
Next Post Next Post THE MOST STUPID GLOBAL WARMING STORY THIS YEAR……..